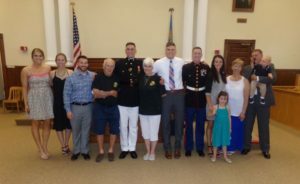 SESTINA COMMISSIONED– Family and friends of Andrew Sestina were in attendance as he was commissioned as a 2nd Lieutenant in the U.S. Marine Corps last Friday. Shown from left to right are: Kristin Sestina, Jennifer Sestina, Alex Anderson, Richard Gaydos, 2nd Lieutenant Andrew Sestina, Mary Gaydos, Nate Sestina, Sgt. Jason Sestina, Brianna Minnock, Carrigen Minnock, Ricki Sestina, Liam Minnock-Sestina, and Don Sestina.